Apparatus 22 works with the phantasm constructed by the fashion industry, the artists revealing the moments of truth and emotions that rise to the surface through the fissures of the “blueprint-of-enhanced-reality”. They hijack the language used in fashion, its hypnotic strategies of seduction, in order to imagine a different future, the same as the Soyons Impossibles collective hijacks the format of yoga exercises with the aim of revealing the interdependence between spiritual transformation and political emancipation, asking themselves whether personal reconstruction by means of actions achieved using one’s own body can redress economic injustice or discrimination. Iulia Toma meditates on the social code imprinted by the wearing of standardised garments (uniforms, overalls, white coats), and is interested in the mutations that have occurred in the status and representation of female labour in the work place and in the context of housework before and after 1989. In the case ofTariana Fiodorova and Raluca Popa, reflection on the past intertwines with elements drawn from their own personal histories, with both artists taking as their starting point works created by their fathers. Fiodorova creates an artist’s book in which she questions the position of the artist in Soviet Moldova, while Raluca Popa constructs an animation, thereby re-contextualising a corpus of drawings in her attempt to recall – and at the same time analyse – her father’s work. Moving from personal experience to investigation of exterior reality, Sorin Popescu exploits the precariousness of street furniture, transforming it into a rudimentary photographic device. In this way, the image is the result of an act that completely suspends the subjective involvement of the artist, also acting as a critical commentary on the hyper-technological present. Resonating with current panic about the imminent end of the world, the Monotremu collective put forward an optimistic vision in which the destruction is celebrated in spectacular choreography, given that the artists believe that everything we destroy and celebrate exists within a relationship of complete interdependence. Starting from the premise that in Romania the production possibilities in contemporary art are almost non-existent and that artists from newer generations are constantly challenged when it comes to the actual realization of their projects, Salonul de proiecte acts as a platform for encouraging artistic practices that address current social and political issues. 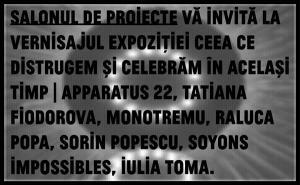 Salonul de proiecte is a program initiated by Magda Radu and Alexandra Croitoruand it runs with the financial and logistical support provided by the National Museum of Contemporary Art (MNAC). The initiative is aimed at creating exhibitions, presentations and debates that focus on contemporary Romanian art, placing the work of younger artists within a broader chronological context. "What We Destroy and Celebrate at the Same Time" Art Show in Bucharest. You can get here description, reviews, address, time and details of "What We Destroy and Celebrate at the Same Time" Art Show in Bucharest. Visit Bucharest Tips for more Art Show events in Bucharest!